Hubble image of quasar 3C 186 racing out of from its host galaxy, 8 billion light-years away from Earth. Credit: NASA, ESA, and M. Chiaberge (STScI and JHU). Astronomers still have yet to directly capture an image of a black hole—they’re working on it—but they know where some of the largest ones are: inside the hearts of galaxies, where they power brilliant and powerful quasars whose light can be seen across the Universe. Some of these supermassive black holes (SMBs) can contain the mass of millions if not billions of Sun-sized stars and, when two galaxies happen to collide (which they often do) their respective resident SMBs can end up locked in an orbital embrace. As their spinning dance grows tighter and tighter they send out gravitational waves, rippling the very fabric of space and time itself (the LIGO experiment announced the first detection of these waves in 2016.) But if the gravitational waves are uneven, say because the two merging SMBs are of vastly different masses and/or individually spinning in different orientations (a possible but not common scenario) then the super-duper-supermassive black hole that results from the merger can end up getting one serious cosmic-scale kick after the event occurs and the waves shut off—perhaps a strong enough kick to send it hurtling out of the galaxy altogether. That’s what astronomers think we’re witnessing here in this image from the Hubble Space Telescope. It shows the brilliant quasar 3C 186, which appears to be well outside the center of its home galaxy (within the dotted blue oval). 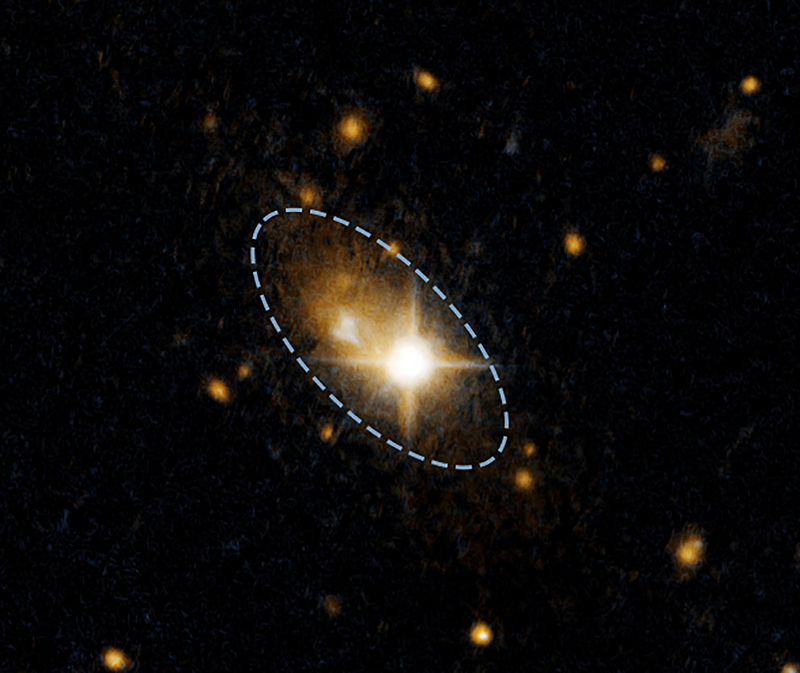 This quasar contains a supermassive black hole about one billion times more massive than our Sun, and based on observations of the gas around it it’s racing away from the center of its galaxy at a velocity of about 4.7 million mph… that’s fast enough to get from the Earth to the Moon in three minutes. At that speed this quasar and its SMB will leave its home galaxy completely in about 20 million years, becoming a rogue “runaway” quasar in intergalactic space. The wayward quasar was discovered by surprise during a Hubble survey of distant galaxies undergoing mergers. Read the full story in a Hubble news release here. *And if you’re wondering what the headline is in reference to, you might not be a child of the early ’80s. Click here. Next Post What Is Space?